I was fortunate enough to attend last night's highly anticipated Jay-Z and Kanye concert at the Bank Atlantic Center in Sunrise, FL. I bought the tickets before the Miami show was announced (I live directly across the street from the venue, the American Airlines Arena. Ain't that where the Heat play? ), but after listening to Kanye strain his vocal chords all night and even apologize that he was run down from the flight, I thought tonight's show might be canceled. If Kanye does manage to perform, I suspect it will be not quite as good as last night's. T'would be a shame, but I've gotta warn a brother. As a loyal Lexus owner, not only did I take the I-95 "Lexus Lane" (nickname for Miami's toll lane on the highway) up to the concert venue, but I love the Bank Atlantic, since parking is free for Lexus owners, and not just because we're better than regular people, but also because Lexus is a major sponsor of the arena. There's a special Lexus lot, but it was full when I arrived, so I just parked with all of the non-Lexuses. Don't worry, I parked next to a Range Rover and right near a white Ferrari that was parked in a handicapped spot. 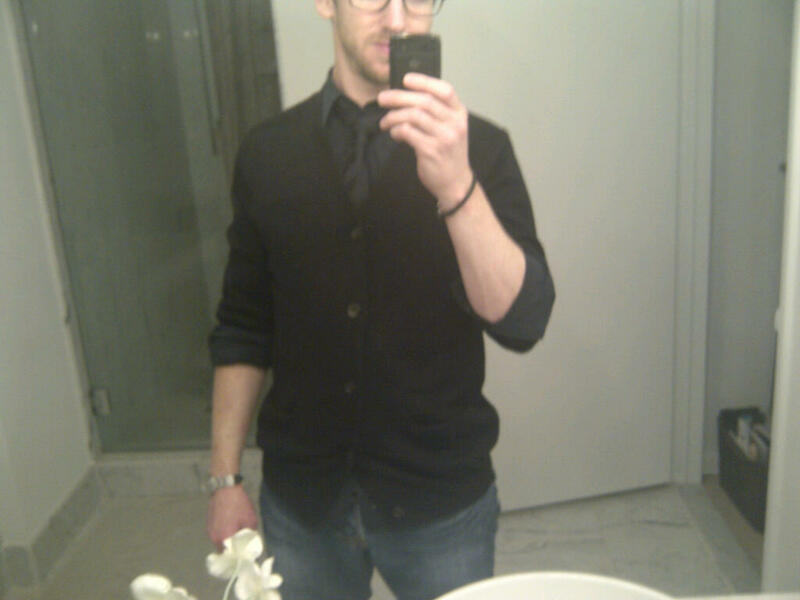 Well, all black mostly everything, at least. Surprised to break out my Rambo costume boots again so soon. They were a good purchase, it turns out. Sitting next to me, in the nosebleeds as you can tell from the first photo, was a really, really old couple. They were at least in their 70s. I don't know if they were chaperoning their grand kids or what, but they were old. So old. If they had better seats, I might think they were the ones who parked their Ferrari in the handicapped spot. About 45 minutes into the show, Jay-Z asked us if we were having a good time "thus far". That's bourgie ("boo-zhee"). Kanye wore a leather Roman centurion skirt. I actually like his style for the most part, but he certainly looks like a clown sometimes. And last night he looked ridiculous, especially when compared to Jay's effortless style (black pants, black boots/Air Jordans, black Yankee cap with alligator skin brim, black jacket). Kanye sported a seriously satanic goat Baphomet t-shirt (this) and a hideously ugly patterned jacket that an old Jewish lady might wear. I don't know what the deal is with all of that Masonic devil worshipping stuff from a guy who claims he's never going to Hell since he made "Jesus Walks". Whatever, dudes. Make that money. You're not brainwashing me. I'm not throwing my diamond in the sky. Sorry. Love your music though. The show was incredible. Amazing lights and stage. 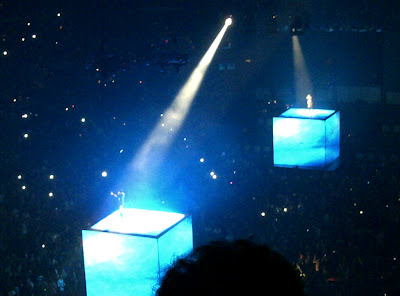 The two megastars opened the show standing on two rising stages that were enormous cubicle LCD screens onto which were projected slow motion videos of wild animals (see above). There were lasers shooting all over the arena in waves and forming rotating geometric shapes. Strobes that pulsated over the rappers and projected their spotty images onto the large screens. An enormous American Flag that was unfurled for "Otis". Energetic and enthusiastic performances from both rappers. They really looked like they were having a great time up there. Jay continues to impress me with how easy he makes it look. Never a mistake. Never straining himself too hard. Never concentrating to remember the lyrics. They just flow out of him in perfect rthym and cadence. I've seen him in concert before and it is awe inspiring. Kanye, on the other hand, has to work a little harder, it seems. He closes his eyes a lot, I suspect to focus on the words that he is notorious for forgetting. He was already losing his voice last night, so I find it practically impossible to believe that he will fulfill his commitment to all of the ticket holders around North America. I'll be watching that. No question that these guys work their asses off. Highlight of the night was "99 Problems". Spectacular. If this show is coming to your town, I highly recommend that you buy yourself a ticket. Stay tuned for some live discussion of the concert on this week's podcast.